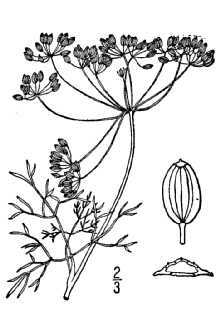 The common names for the herb Anethum is Dill. 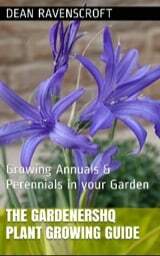 The life cycle of this genus is that of a short lived perennial, though it is usually always grown as an annual by gardeners. The plant typically flowers from the middle of summer until the middle of autumn. Anethum are small herbs that typically grow to between 40 and 80 centimeters in height. They have feathery leaves that are blueish green in color and have clusters of very small yellow flowers. They make great plants for herb gardens; due to their awkward appearance they should not be grown as part of a flower garden. Dill photograph by Carl E Lewis. USDA-NRCS PLANTS Database / Britton, N.L., and A. Brown. 1913. Illustrated flora of the northern states and Canada . Vol. 2: 634. Image of Dill Seeds by Andreas Balzer. There is only one member of the Anethum genus (Anethum graveolens). The plants originated in the East of Europe and wild varieties are present throughout Mediterranean regions of Europe and in Western Asia. 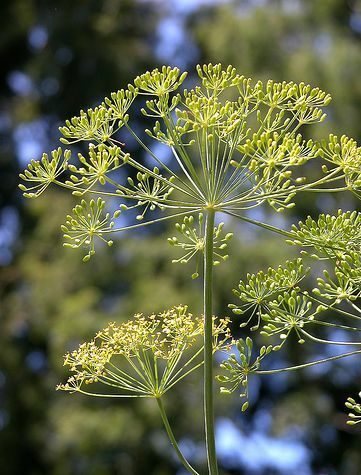 Anethum are members of the ninety one member Apiaceae (carrot) family and is closely related to Anise (Pimpinella) Chervil (Anthriscus), Celery (Apium), Coriander (Coriandrum), Fennel (Foeniculum) and Parsnip (Petroselinum). Dill has many culinary uses and both its leaves, flowers and seeds can be used. The leaves are aromatic and are often used to add flavor to food, especially salmon, salads and soups. The Dill flowers may be pickled. The seeds of dill can be used as a spice in fattoush salads, to flavor boiled potatoes, breads. Also many Thai seafood dishes make use of Dill where it is used to flavor coconut curries. Common Names: Dill, Bouquet, Fernleaf, Hercules, Saatgut, Tetra. Flowers: End of spring and summer. Flower Details: Yellow, white. Small umbels. Sow Outside: Surface. Sow out continuously at two week intervals from a month before the last frost through to the middle of summer. Spacing 10 to 12 inches (25 to 30 cm). Sow Inside: Does not like to be transplanted so use peat pots. Germination time: two to three weeks in the light. Temperature 60 to 70°F (16 to 21°C). Five or six weeks in advance. Transplant outdoors following the last frost. Indoors: If growing indoors as a pot herb then ensure that Dill receives at least six hours of sunlight daily. Requirements: Full sunlight or light shade. Good drainage. Soil pH 5.5 to 7. Rich soil. Moist soil. Feed at the start of the growing season. Water to keep soil moist. It is best to plant Dill on the soil surface, every two to three weeks to maintain a crop. Seedlings should be spaced so as to be about twenty five to thirty centimeters apart. Dill should be sown out starting from the early spring until the middle of summer. Anethum should to be grown in the sun. The soil type should be rich and well drained; ideally the soil pH should be in the range of 5.5 to 6.5. It is best to fertilize the soil at the same time as transplanting seedlings that have been grown inside. 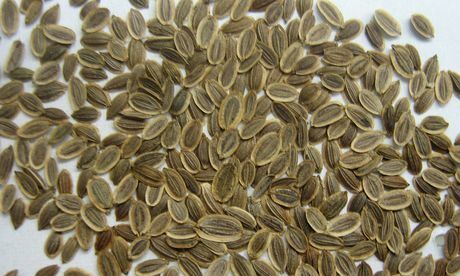 When starting Anethum off from seed indoors, the seeds should be sown six to seven weeks before transplanting. Dill requires to be fertilized in the early spring, this will ensure hearty growth throughout the summer. The Anethum graveolens plants should be sheltered from winds. It is important that they are not planted in the same vicinity as Fennel, as the herbs are able to cross fertilize, and the taste of the hybrids is not to be desired! Dill can be grown inside during the winter months, but should be exposed to five to six hours of sunlight daily.